The main purpose of a protection plan is to secure the financial interests of the insured’s family members. These plans provide lump sum payouts to family members in the case of the insured’s unexpected death. Term insurance plans are offered by all life insurance companies operating in the market. 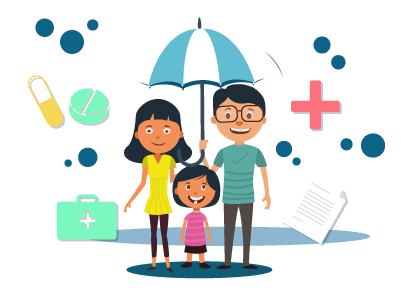 Reliance Nippon Life offers two different term insurance covers for its customers to protect their families from unexpected eventualities. When choosing a term insurance plan, you can pick the right coverage amount through the premium calculator available on the company’s official website. Why you need Premium Calculators? There are about 24 life insurance firms in India. These firms have different types of term insurance covers for their customers. Choosing one specific plan from this long list of plans requires a lot of research. When you do your research, you need to find the best plan that fits within your budget. Premium calculators help you determine this by providing information about the cost of a term insurance plan. Rather than waiting for the company to give you this information, you can figure out the cost on your own with the help of premium calculators. Locate the protection plans offered by the company by clicking on the menu labelled ‘life insurance plans’. On the resulting page, click on the plan you wish to purchase. When the plan page has opened, click on the calculator button located at the top right corner of the page. On the premium calculator page, enter various details like name, gender, date of birth, policy term, payment method, sum assured amount, etc. Once you have entered these details, click on ‘calculate’. The resulting page will display the premium amount for the chosen policy. You can try the same method for the other term insurance plan offered by the company. Customers can calculate the costs of term insurance plans instantly using the premium calculator. This saves them a trip to the branch office and ensures easy access to information about various policies in the company’s lineup. By accessing the premium calculators of various plans, customers can improve their knowledge about various products available in the market. This will also help them make the right decision when they purchase a term plan suitable for them. The cost of a term insurance plan is based on various factors like sum assured amount, age, health condition, income, smoking habits, location, etc. The calculation used to determine the premium of a product is complex, and it is not possible for everyone to manually calculate it when they do research. Premium calculators offered by life insurance companies are simple, handy tools that can be accessed by anyone through the insurer’s official website. This also helps insurers by allowing them to reach to a large customer base located in different parts of the country. Term plans are the cheapest of life insurance plans as they do not offer any maturity benefits at the end of the policy term. These plans are ideal for people who wish to financially protect their family members if they are no longer there to provide for them. The term plans offered by Reliance Nippon offer the same benefits to customers. With the right term plan, one can certainly protect their family members from getting exposed to unexpected events. By using the term insurance premium calculator, individuals can find the best product that fits within their budget.